Louisiana governor John Bel has signed a bill this week that will enable the state’s riverboat casinos to move onto nearby land. The bill was presented after scraping through legislature by just a single vote. In essence, Senate Bill 316 allows riverboat casinos to move up to 1,200 feet onto dry land from their current berth. Importantly, it also facilitates a change to the maximum allowed gambling space per boat from the current limit of 30,000 square feet. Consequently, they will be allowed to offer 2,365 gaming positions each. While the bill is welcome news for the state’s riverboat casino operators, there are further hurdles to clear. 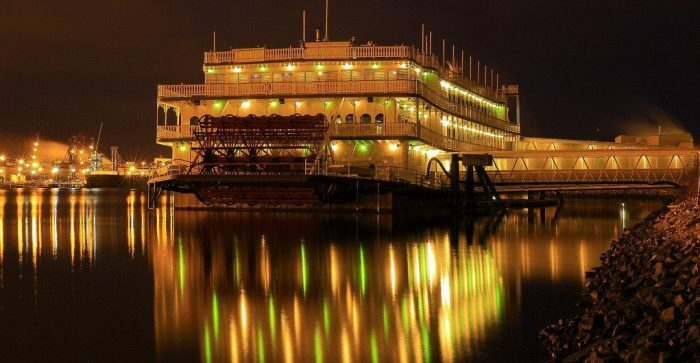 The new regulations will apply to all of Louisiana’s 15 riverboat casinos, however they are likely to have to wait for six months or longer before they can apply for a move to become land-based where they will join the state’s sole dry casino, Harrah’s New Orleans. Yet to be ratified are the designs and applications procedures relating to any future land-based facilities. Once that process is completed, the regulatory framework won’t be adopted until it gains full public approval. Those who back the switch from water-borne to land-based casinos, argue that with modernisation the riverboats will become significant revenue generators for Louisiana’s state coffers. They also contest that the measures are needed to help Louisiana keep pace with other states in a newly regulated sports betting environment.